All fiber optic transmission systems consist of fiber optic cable and two or more electro optic converters. These converters are used to change the electrical signals carrying data to light based signals for transmission across the fiber cable. The fiber is able to contain the light signals by the use of different refractive indexes, which effectively bounce the light along the fiber within a central core. Fiber optic cables are referred to as either multimode or singlemode dependant on how many rays or modes of light can be carried in the central core. Multimode cables carry many modes of lighte in the central core while a singlemode fiber only allows one ray to travel along the cable. 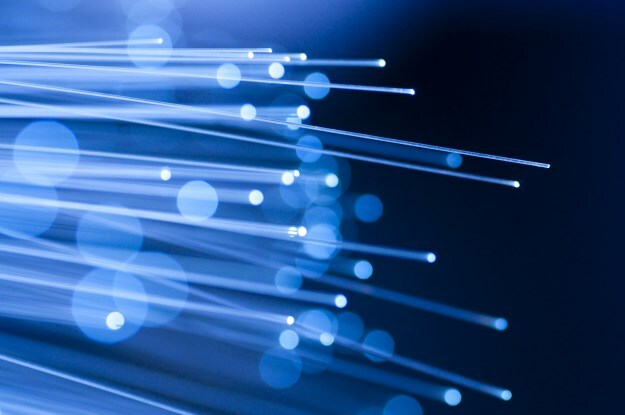 The fiber is able to contain the light signals by the use of different refractive indexes, which effectively bounce the light along the fiber within a central core. Fiber optic cables are referred to as either multimode or singlemode dependant on how many rays or modes of light can be carried in the central core. Multimode cables carry many modes of lighte in the central core while a singlemode fiber only allows one ray to travel along the cable. Singlemode systems are able to operate faster (and therefore carry more data) and are able to transmit over greater distances. Multimode systems cannot carry data as fast or as far but cheaper components make this type of system more cost effective for smaller networks. Once installed a fiber cable can be used for simple point to point links or with multiplexing technology. This ensures that the requirements for additional data handling can be covered by changes to the transmission equipment rather than the need for additional cables.